Familial Shar-Pei Fever (FSF) has been reeconginzed problem in the Chinese Shar-Pei breed since the early 1980’s. Research has given us much information concerning the hereditary aspects of the disease and some of teh pathophysiology of the condition, but unfortunately, no blood test to diagnose the disease. Recent advances in molecular genetics have demonstrated that FSF is not the same disease as Familial Mediterranean Fever in man, even though the symptoms are very similar. With advances in melecular biology and break throughs in other genetic diseases, it is only a matter of time before we have enough information to make some headway in the diagnosis of FSF. Until then, what can we do? I think we have to institute breeding proctivces which will give us the best chance to breed away from the disease. I recommend breeding for logevity. Even if the dam or sire die of amyloidosis at 10 years of age I can accept that. I would not breed to any line with FSF and/or amyloidosis in its background. I also would not breed to any dog with FSF, amyloidosis or unexplained kidney disease it its pedigree. These recommendations require that breeders do their homework and communicate with each other honestly. It requires breeders to follow up on their puppies and see what’s happening to them several years down the line. You know though, breeding good, healthy, sound dogs have been easy. This issue of the newsletter contains one topic — a plan of action to diagnose kidney failure in Shar-Pei at an early stage when treatment has the best chance of success. I hope you find it helpful and informative. If you have any questions about FSF, amyloidosis and/or kidney failure please don’t hesitate to call the office or schedule and appointment. Renal amyloidosis has hit the Shar-Pei fancy in recent years and left many of us feeling helpless as we watch young Shar-Pei sicken and die before our very eyes. We don’t have to sit and take it, but can gather the facts and formulate a plan of action. What I propose in this paper is based on the information available today about renal amyloidosis. Currently, there is no test available to help pinpoint Shar-Pei at risk for developing the condition and due to ethical considerations, information concerning pedigree analysis is not available to help determine those dogs who have the condition in their background. What we are left with is to try to uncover the condition in our dogs as early as possible and to institute steps to minimize the effects on our dogs and increase longevity. The following plan has no guarantees and certainly will change as new information becomes available, but it represents a starting point and a step to build on further. Monitor weight – This involves weighing your dog at regular intervals using a scale. Do not rely on eyeball judgements. Too often I see dogs in an advanced state of weight loss which the owner has just noticed, but which has been going on for several weeks. Remember, we are trying to uncover this condition at its earliest point – minor weight loss can indicate early renal amyloidosis. Monitor appetite – Daily fluctuations in appetite do occur, but a change in what is normal for your dog may indicate early kidney problems. Monitor water consumption – A normal dog consumes approximately 1 oz. of water per pound of body weight per day. This varies with activity level, season of the year, type of food being fed (canned vs. dry), etc. I advise measuring water intake periodically by measuring how much water is put down in the morning and measuring it again at night. Obviously this will involve a little more ingenuity on the owner’s part when multiple dogs are involved. Increased water consumption may indicate early kidney failure. In addition to the above home monitoring program, I also advise having your veterinarian check a urine sample every three months on any Shar-Pei over two years of age. The main parameters I watch in the urine are the urine specific gravity and the urine protein reading. Urine specific gravity is a measure of the concentration of the urine. If the kidneys were not functioning at all this reading would be 1.008 – 1.012 (a dilute urine). Normal concentration should be above 1.025 and sually is greater that 1.045 (a concentrated urine). Ideally the urine sample should be a morning sample collected after the dog’s water bowl has been removed overnight (remember to close the toilet lid!). By depriving the dog of water overnight we force the kidneys to concentrate the urine, if they are able to do so. Inability to concentrate urine indicates that approximately 75% of the kidneys are non-functional – this is still compatible with life, but treatment needs to be started quickly to preserve the remaining kidney function. The other urine test I heavily rely on is the urine protein level. The stick test routinely run by veterinarians primarily measures urine albumin levels. An elevated urine albumin level means that protein is being lost in the urine and correlates with glomerular damage (the glomerulus is the filtration unit of the kidney and serves to filter out the waste products of the body). High levels of protein in the urine indicates significant kidney disease and additional testing needs to be done to obtain a diagnosis. A new more quantitative microalbuminuria test is now available for in-hospital use from Heska, the E.R.D.-Screen™ Urine Test. The “gold standard” for proteinuria is the urine protein/creatinine ratio (UPC) which is run by all the commercial veterinary laboratories. 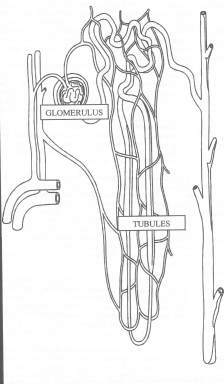 Glomerular – If the amyloid deposits occur primarily in the glomerulus, we see increased protein levels in the urine. Tubular – If the amyloid deposits occur in the tubular part of the kidney we see loss of concentrating ability which manifests as a dilute urine. Combination – This occurs when amyloid is deposited in both the glomeruli and the kidney tubules and we see increased protein levels in the urine and dilute urine. A complete blood count – This includes a packed cell volume, a white blood cell count, red blood cell count, platelet count, and a white blood cell differential count. A health panel – This includes at least a BUN, creatinine, sodium, potassium, calcium, phosphorous, cholesterol, total protein, albumin, globulin and, glucose. It often includes liver tests and thyroid hormone levels. An immune panel – This should consist of a direct Coomb’s test, an anti-nuclear antibody test (ANA), a Rheumatoid arthritis factor test (RA), and an LE prep for systemic lupus. A urine protein/creatinine ratio – A value above 1.0 is considered abnormal and indicates excessive urine protein loss. Abdominal radiographs – Used to evaluate kidney size and shape. Diet – A low protein diet is initiated using Hill’s Prescription Diet K/Dâ or its home-made counterpart. I’m also using the Iams Eukanuba Veterinary Kidney Diets – Early Stagesâ and Advanced Stagesâ. There are other kidney diets available as well by other pet food manufacturers. Ascriptinâ – 1/4 tablet once a day or low dose aspirin(81mg) ½-1 tablet daily. 1-2 cooked eggs per day – used in cases where albumin is being lost in the urine. A. Colchicine – this dose can be obtained from Dr. Linda Tintle or myself (see the July/August 1992 issue of The Barker). B. DMSO – numerous dosages are in the veterinary literature. Your veterinarian should refer to an excellent article on renal amyloidosis by Dr. DiBartola in Current Veterinary Therapy XI. Coagulation panel – Increased levels of fibrinogen may indicate impending thromboembolism (throwing of blood clots) associated with DIC (Disseminated Intravascular Coagulation) especially if associated with increased cholesterol and decreased albumin levels (nephrotic syndrome). This panel should include a platelet count and a measurement of FDP’s (Fibrin Degradation Products). Fractional clearances of various eletrolytes (sodium, potassium, calcium and phosphorous). Creatinine clearance testing to evaluate kidney function (glomerular filtration rate – GFR). Early on, the animal is a much better surgical candidate and many complications of renal amyloidosis such as bleeding tendencies and uremia are not present. There is a real danger in the Shar-Pei to blame every kidney problem on renal amyloidosis and fail to pursue other causes of kidney disease such as kidney infection, heartworm disease, and immune-mediated diseases like systemic lupus and immune-mediated glomerulonephritis. The information from an early kidney biopsy can guide the medical and dietary management of the case and provide valuable prognostic information. Nephrotic syndrome – characterized by decreased serum albumin, increased serum cholesterol and increased protein loss in the urine. A serious complication of this syndrome is thromboembolism (“throwing blood clots”). Your veterinarian may do a blood fibrinogen level and coagulation panel to evaluate the blood clotting system. If the fibrinogen level is >300 mg/dl, aspirin therapy is strongly indicated. Another serious complication of this condition is the development of edema or fluid accumulation in the abdomen or chest and in the limbs. In this case, the use of diuretics such as Lasix may be necessary. Uremia – or the accumulation of body waste products which are normally filtered by the kidneys into the urine. The build-up of these wastes causes clinical signs such as appetite loss, weight loss, vomiting, diarrhea, depression and lethargy. More serious effects include anemia (decreased red blood cell production) and gastrointestinal ulceration. Treatment here may include intravenous fluid therapy, dietary therapy such as Hill’s Science Diet U/Dâ, Iams Eukanuba Veterinary Kidney Diet – Advanced Stagesâ, phosphate binders such as Amphojelâ, ulcer medication such as Carafateâ and other therapy as deemed necessaryby your veterinarian. Eventually, uremia will progress and lead to the death of the animal. As an aside, current nutritional research indicates that there is no advantage to instituting dietary protein restriction prior to the onset of kidney failure. This means that feeding protein-restricted diets prior to developing laboratory or clinical signs of kidney failure will not prevent kidney failure. Hypertension – The kidneys are very important in the regulation of blood pressure. It is speculated that up to 80% of the dogs in kidney failure have significant hypertension as a consequence. The use of indirect blood pressure monitoring in animals has recently become available to the veterinarian and hopefully will lead to more advances in this area. Your veterinarian may wish to institute therapy using vasodilators and/ or diuretic medication. 4.Disseminated Intravascular Coagulation (DIC)– The body’s coagulation system is in a fine state of balance between forming blood clots and dissolving them. When this balance is disrupted coagulation factors are used up before they can be replaced and out of control bleeding is the result. This condition is associated with high mortality and is a poor prognostic factor. Treatment is not very effective. Streptococcal Toxic Shock Syndrome (STSS) –This is an unusual complication which results in areas of skin death leading to skin sloughing almost like a burn. The condition seems to be caused by toxins produced by Streptococcus canis and is rapidly fatal sometimes in spite of treatment. To what extent early diagnosis and monitoring contributes to the longevity and quality of life of renal amyloidosis patients is hard to quantify at this time. My feeling is that it is possible to slow the progression of the condition and improve the short-term prognosis for these patients. We can probably add several months to their life span. It’s expensive and requires diligence and hard work on the part of both the owner and their veterinarian, but the reward is some extra time with a close friend. Any or all of the following therapeutic agents may be used in the treatment of chronic renal failure in Shar-Pei. The definitive treatment of your dog will depend on decisions made with your veterinarian. Dosages are based on my experience and may be adjusted by your veterinarian based on their experience or on more recent dosage information. Fluid therapy – in-hospital treatment typically involves intravenous administration. Home care may involve subcutaneous administration. May add B vitamins to stimulate appetite and replace water-soluble B vitamins. Rate is usually 2-3 times maintenance. Histamine H2-receptor antagonists to inhibit stomach acid secretion. These include Tagamet HB®, Pepcid® and Zantac® tablets. Aspirin 81mg tablets – ½ – 1 tablet once a day for hypercoagulability problems. Phosphate binders – typically aluminum hydroxide agents such as Basaljel®, Amphojel®, Maalox® and others. Average Shar-Pei would be dosed at 200mg three times a day. Another agent is sevelamer (Renagel®) dosed at 30-135 mg/kg/day divided given intact with meals. This drug does not promote hypercalcemia or absorption of aluminum. Should monitor clotting ability when used in dogs (PT).A new veterinary product is Epakitin® available from Vetoquinol which contains chitosan from shellfish to bind phosphorus. An average Shar-Pei would receive 3 measuring spoons twice a day with food. Metoclopramide (Reglan®), an anti-emetic at 5-10mg three times a day for vomiting. Zofran® (ondansetron) 0.5-1.0mg/kg 30 minutes before food. Dansetron mesylate (Anzemet®) is an injectable anti-emetic which is given once a day at 0.3mg/kg. Pet Tabs® (vitamins) 1 tablet twice a day. 3V Caps® (large breed) 1 capsule once a day – a fatty acid supplement as an anti-inflammatory agent for the kidneys. Colchicine 0.6 mg twice a day – amyloidosis. Human recombinant erythropoietin (Epogen®, Procrit®) for nonregenerative anemia (low red blood cell count) associated with chronic renal failure. Start with 100U/kg subcutaneous injection 3 times a week until PCV is between 37-45% then decrease schedule to one injection a week. MUST monitor PCV and serum iron levels. Dogs can develop antibodies to this drug. DO NOT USE IN DOGS WITH HIGH BLOOD PRESSURE! We want to delay the use of human EPO due to the risk of antibody production against the hormone (22%) and the potential of more serious possible cross antibody attack against the patients’ bone marrow – bone marrow aplasia. Prescription Kidney Diet – generally low protein and low phosphorous. Hill’s K/D or U/D Diet®, Iams Eukanuba Veterinary Diets Nutritional Kidney Formula Early Stages or Advanced Stages Diet®, Purina CNN Kidney Diet®, others. THE MOST IMPORTANT GOAL IS TO KEEP THE PATIENT EATING – THERE IS NO POINT IN STARVING THE PATIENT TO USE THE CORRECT DIET!! Feed smaller meals more often – more likely to hit the dog when they feel like eating. Appetite stimulants such as cyproheptadine (Periactin®) at 5-20mg one to two times a day and mirtazapine. Propofol at 1mg/kg IV stimulates appetite within 15 minutes. B vitamins via injection or added to subcutaneous fluids may stimulate appetite also. Proton pump inhibitors — Prilosec® (omeprazole) 20 mg/dog sid (0.7 mg/kg) 20mg capsule. Ulcer adherent complex — Carafate® (sucralfate) 0.5-1.0gm/dog bid-tid 1 gm tablets. Sodium bicarbonate 650 mg tablets — 2 tablets tid based on base excess. Try to maintain plasma HCO3 concentration at 15 mEq/l or greater. Ferrous gluconate 242mg tablet – ½ tablet sid (see discussion under EPO). A new veterinary product called Azodyl® available from Vetoquinol. It relies on a process called “enteric dialysis” which utilizes bacteria to fix nitrogen in the colon. This reduces uremic toxins. The dose for an average size Shar-Pei is 2 capsules in the AM and 1 capsule in the PM. Calcitriol – when serum phosphorus concentration ≤ 6 mg/dl. Initial dose is 2.5ng/kg/day. May increase calcitriol doses about 0.75-1.0ng/kg to a maximum dose of 5ng/kg. Treatment endpoint is to normalize serum PTH levels without inducing hypercalcemia. Amlodipine besylate (Lotensin®) is a calcium channel blocker used in treating hypertension. Start dosing at 0.1mg/kg orally b.i.d. and up-titrate weekly while monitoring blood pressure. ACE (Angiotensin I Converting Enzyme) AT1 receptor antagonists – irbesartan (Avapro®) 5-30mg/kg once a day, telimsartan(Micardis®) 0.1-1.0mg/kg once a day. I currently maintain a web presence at www.drjwv.com. My hope is to update this site periodically as new information becomes available. This site represents my own opinions based on reading the veterinary literature and in no way reflects the opinions of the CSPCA, Inc. or anyone else. The Officers and Board of Directors of the Chinese Shar-Pei Club of America supports research for Familial Shar-Pei Fever and amyloidosis. Donations can be sent to the CSPCA Charitable Trust, Lee Arnold, Chairman, P.O. Box 7007, Bedminster, NJ 07921. All donations will be acknowledged in future issues of The Barker. Many of us have felt the pain and loss of a wonderful Chinese Shar-Pei. Let us feel the joy in helping find solutions.